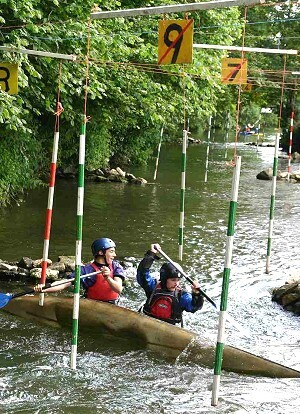 This course is built for Division 3 and 4 events, and is suitable for those starting out in slalom. It is on the river Frome at Langham Farm, where two islands are bounded by the river and a mill stream. The start is next to a weir which is usually dry in Summer. The first part of the course follows the route of the mill stream and walls have been built out from the banks to create eddies. The course then flows sharp left under a bridge into a pool below and finishes with a short flat upstream section of the river. Continuing upstream, it is an easy paddle back to the weir. The site is reached from the A36 Bath to Warminster road by turning off at Woolverton, or from the A361 from Trowbridge at Rode. Although the postcode to Langham Farm farmhouse, next to the slalom site, is BA11 6QL, some satnavs appear to take you via the farm yard. There is no access from the farm yard to the slalom site. Please use postcode BA11 6PB which takes you to Rode Memorial Hall. From there cross straight over Rode Hill and follow the slalom signs. Camping is on the second island, across the bridge. There is car parking on the first island. Caravan parking is at the top of the farm track. The canoe club pitches a marquee next to the course where hot and cold food is available all day.